since 1989 Another year has passed and you are holding the all new Horsefeathers 2017/18 winter catalog. At this point it is typical for company owners to try and convince you that their products look the best, include the finest technical details and are made to the highest quality. This is all true, but there is more to a brand than great product. 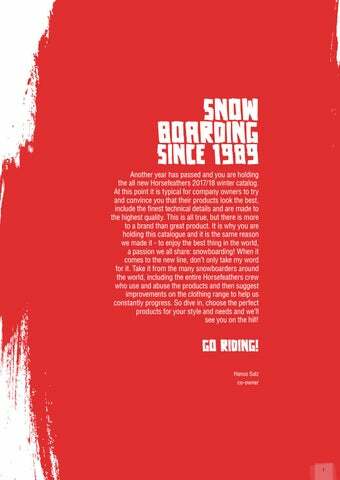 It is why you are holding this catalogue and it is the same reason we made it - to enjoy the best thing in the world, a passion we all share: snowboarding! When it comes to the new line, donâ&#x20AC;&#x2122;t only take my word for it. Take it from the many snowboarders around the world, including the entire Horsefeathers crew who use and abuse the products and then suggest improvements on the clothing range to help us constantly progress. So dive in, choose the perfect products for your style and needs and weâ&#x20AC;&#x2122;ll see you on the hill!